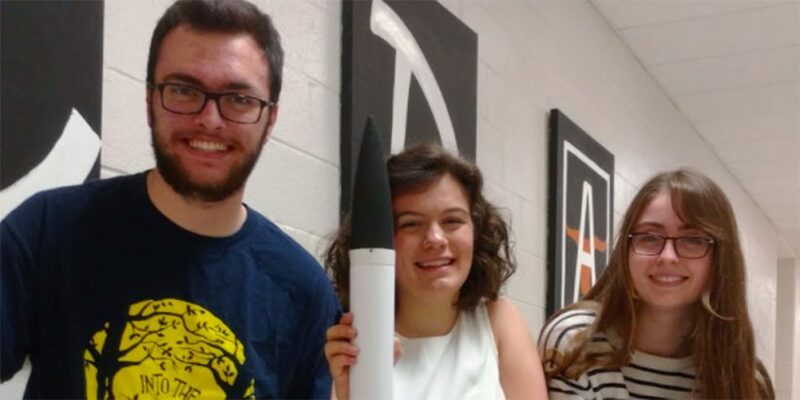 When we heard there was a student competition for rocketry, it felt like a perfect fit for us. Like these students, we share a love for lifelong learning and pushing technical boundaries. And how could we turn down the chance to see our AnswerRocket logo on an actual rocket, reaching for the stratosphere? As you’ll read in their season recap below, the team quickly learned the importance of evaluating issues from multiple angles. That’s vital in business analytics, too. Whether figuring out how to get more efficient with rocket fuel or deducing the root cause of customer churn, you need to explore multiple paths to find the best solution. Congrats to Lanier High on their inaugural adventures in flight! We are students in the Center for Design and Technology (CDAT) at Lanier High School in Sugar Hill, GA. In CDAT we have a “Junior Capstone” project. This is a project that is focused on a specific interest of ours, not necessarily academic in nature. While many schools have a Senior Capstone opportunity, that’s too late for college transcripts, so we start earlier. For our capstone, a teacher suggested doing something we love, and we love rockets! We had no idea on how to get started. Funding was a big consideration, and we had no funding to start. A low budget team needs at least $500 for materials and registration, the bare bones. While we could try and scrape this amount up, we decided to network for possible sponsors. Our teacher knew someone at AnswerRocket, and thought it might be worth a shot to ask. We did, and our team was born! RocketContest.org Team 17-2511, with our rocket “Flying Bullship” (our school is the Longhorns). Analisa is the team leader, an 11th grader who has loved space and avionics as long as she can remember. She signed us up, she made the schedule, and she made those tie-breaking decisions to keep us going. Our main “math guy” was Chad, who has pretty much finished college math before graduating high school. There is a LOT of math in rocketry! We were no “Hidden Figures,” and have so much respect for those who do the job. There were quite a few others on our team with more general roles, but we needed all of us to get this thing off the ground, literally. As rookies, we made a lot of mistakes learned a lot! Rocket fuel can be pretty expensive, as can other parts. There are core items to establish a launching environment, and more. We learned so much in our journey to build a rocket, and to possibly be competitive. We are not alone: there are 13 teams in the state of Georgia, all located north of I-20. They all have the same dreams and goals, and this contest is a great first step to any future rocketeer! Our level of rocket success wasn’t what we had hoped for: Cost overruns on fuel for trials ate up so much budget, and we really didn’t plan well for fixed costs like launching and more. However, we learned that we can ignite a dream. While we didn’t achieve the levels of success we had aimed for, we did start something that could last beyond us, a legacy. As the school year ends, we are pondering our next steps. Watching efforts like those of Musk, Branson and Bezos are so inspiring – we are living in the coolest age of private space exploration! Could we someday be on their team? What about our own? We are sure that we were excited to have this chance, and thank AnswerRocket for their support. We wanted to thank you with a trophy, but cannot. We will thank you by letting you know when we become engineers someday! No turning back now!